Rios claims that he has returned back to earth after his head was stuck in the clouds of success. Alex Ariza is gone from his camp, now he and his world renowned trainer Robert Garcia are going back to the basics. Strength and condition coach or not, Rios better have been on his best behavior to prepare for a hungry and dangerous fighter like Chaves. Diego Chaves has a snappy jab and loves to throw chopping hooks to the body and head. He favors his left hand for lead hooks and has a decent overhand right to go with it. The thought amongst fans and media who are picking Chaves are banking on his movement. I question Diego’s capability to outbox Rios only because he hasn’t shown that trait at a high level. He pressed the action for the most part in a loss to Keith Thurman, and in a close victory over Omar Weis. When he was pushed back in both of those fights, he looked very uncomfortable making him vulnerable to a hunter like Rios. Neither fighter is noteworthy for having good defense. Chaves holds his guard up too high something Rios will make him pay for with body punching. Both fighters tend to be wide with their punches and lack of technique could make this fight very entertaining and sloppy at times. It will be a battle of the hooks, and whoever lands the straighter punch from time to time will win this war. Chaves will probably get off to a good start with combination punching and movement. As the fight enters the midway point, Rios will begin to walk Chaves down with heavy hooks. Bam Bam’s constant pressure will slowly but surely wear down Diego turning a two-way battle that should give us great exchanges, into a one-sided affair in the later rounds. Brandon Rios has his back against the wall and I fully expect him to use his animal instincts to grind out a win. Whether Chaves decides to bang or box, will dictate how long this fight remains highly competitive. If Diego Chaves chooses to move, he may run but he can’t hide and Rios will metaphorically kick the can with hooks to body and head. My official I prediction is Brandon “Bam Bam” Rios by late stoppage to the body. Brandon Rios and Diego Chaves look to steal the show in Las Vegas. The “Krusher” returns in a stay busy fight from Atlantic City, in this dual site card broadcasted by HBO this Saturday night. After the Adonis Stevenson saga killed a super fight of sorts at 175, Sergey Kovalev’s career is at a stalemate, giving boxing fans the Boardwalk blues. For now he will be facing a stay busy opponent in Blake Caparello. The Boardwalk stalker is known for hunting down his opponents and then crushing them. Most think he’ll do more of that when he steps in the ring to square off against Blake Caparello. Caparello’s game plan will be to stay active, and stay away from Kovalev’s power punches. It remains to be seen how long he can elude the barrage of incoming attack? On the surface Blake has a good record of 19-0-1. It doesn’t take much digging to see that his resume is weak, with the only name being Allan Green as a standout opponent. Kovalev himself hasn’t exactly faced a murder’s row either but, at least he has some quality veteran names under his belt. I don’t think much of this matchup so I won’t beat around the bush. Caparello’s best bet is the hope that Sergey Kovalev won’t be fully focused on this fight. There’s always a chance to see how Sergei would react deep in a fight being that he has never boxed past 8 rounds. Unless “The Krusher” forces the issue by attempting to land a bomb only, my guess is it won’t take long for Kovalev to adjust to Caparello’s movements and take him out. In the year of the upsets or perceived mismatches, there is a glimmer of hope for Caparello. Maybe he surprises everyone except for his promoter Lou Dibella, and gives a tougher than expected fight. My gut tells me it will be either a short night or a brutal and punishing long night for Caparello. 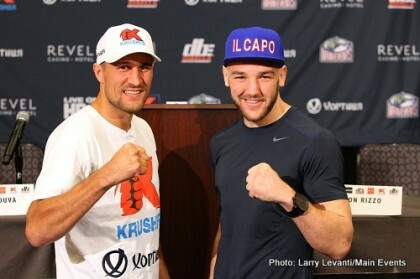 My official prediction is Sergei Kovalev to krush by mid to late stoppage. Shifting gears to the main event were Brandon Rios and Diego Chaves our featured in a game of career chutes and ladders in the deep and rough waters of the welterweight division. By the way Jessie Vargas makes a non-descript title defense against Anton Novikov. 3 losses in a row in NBA is the norm, even for a championship caliber team. Boxing is a “what have you done for me” type business and if Brandon Rios losses 3 fights in a row his career will be over as a top flight fighter. A close but clear loss in his second fight with Mike Alavardo, and a whitewashing by Manny Pacquiao has “Bam Bam” Rios in a tough spot leaving the public to wonder if the thrill is gone. The critics say he is shopworn and is all but done as a premium cable name. It’s hard to argue with that label because of all the punishment Brandon Rios has endured in the ring and at the scales. Win, lose, or draw, Rios has put his body through hell since arriving at the world as an underdog versus the 30-0 Anthony Peterson in 2010.